This print depicts the tenth-century warrior Minamoto no Yorimitsu, also known as Raikō, who was famed for his legendary skill in the martial arts. 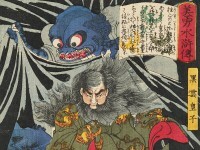 This scene shows an episode in which Raikō, seen on the far right of the triptych, has been overpowered by the evil magic of the vicious earth spider and has fallen into a dreamlike trance. His four retainers are unaware of the demons. The print was also seen as a satire on the unpopular Tenpō reforms that were carried out in the 1840s. The sleeping Raikō could be interpreted as the shogun and the ghosts as the suffering victims of the reforms.